The Spanish language has an important role in the development and growth of the US Catholic Church. Although Spanish is not considered an official language by the U.S. government, the Catholic Church has already made that step in order to maintain the unity and diversity of the institution. During the last decade, the social and liturgical services provided in Spanish have been growing, and the Hispanic presence has been a sign of vitality. The history of the Spanish language within the Catholic liturgy coincides with the use of English as well. However, this path has not been easy and there is still opposition from those who believe in "One Church-One Language" and see Spanish as an element of division among U.S. Catholics. 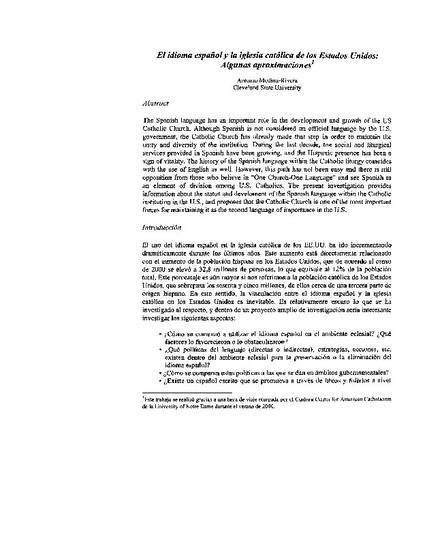 The present investigation provides information about the status and development of the Spanish language within the Catholic institution in the U.S., and purposes that the Catholic Church is one of the most important forces for maintaining it as the second language of importance in the U.S.